Back on the market no fault of the seller!!!! 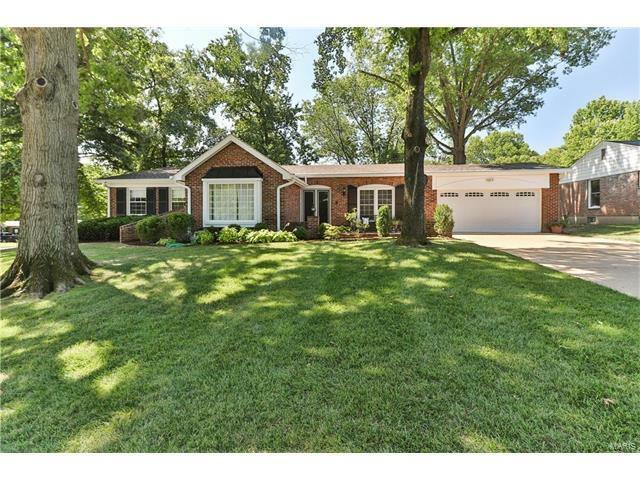 Gorgeous updated ranch in desirable Warson Woods! As you enter this 3 bed 3 bath home with hardwood floors throughout, you will be welcomed by lovely dining and living room. You will fall in love with the beautiful chef's dream eat-in kitchen with breakfast bar, gas cooktop, double oven, custom cabinets and granite! Kitchen opens to lovely wet-bar and planning desk. Bright family room with vaulted ceiling, show stopping stone surround wood burning fireplace, built in bookshelves, glass sliding doors that walk out to brand new aggregate patio and large fenced backyard. Master suite, 2 additional bedrooms and bathroom on the main floor. Large finished lower level with rec room, full bath room, and 2 additional sleeping areas offers 1800 Sq ft of additional living space. All this in award winning Kirkwood schools. Club pool and tennis available. Manchester to north on Woodlawn to West on Monaco. Home is on the left.